Former Senator Phil Gramm (R-Texas) and Representative Lloyd Doggett (CD–25, Austin) most likely differ on many issues. How to best serve the interests of their home State appears to be one of them. While schools all over Texas are facing the prospect of laying off teachers and staff this year due to budget cuts, Congressman Doggett maintains that decreasing the return of Federal tax dollars to Texas’ schools and teachers will guarantee an increase in spending on education in Texas. According to the Department of Education’s own information, the stimulus money was intended to “restore” spending to 2008 levels. In compliance with the American Recovery and Restoration Act - known to most of us as the "Stimulus Bill" - 81% was used for one-time expenses for education: to fund textbooks and increase the State education budget by $1.9 Billion. Teachers were even given a raise. As reported by the Dallas Morning News in September of 2010, the 81st legislature chose not to heap $3.2 Billion “stimulus” dollars on top of education spending that would have been drawn from the savings in our "Rainy Day Fund." Many other States did the same thing and Texas' plan was later approved by Secretary of Education Arne Duncan. Our Legislature displayed logical fiscal planning. The Stimulus money was available for a short period of time, but the Rainy Day savings account is still available in full, even though the stimulus is history. 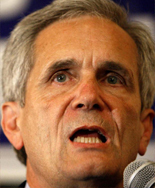 Nevertheless, Congressman Doggett so hated the fact that the 81st Legislature did not spend our savings in addition to the Washington windfall in 2009 that he repeatedly carried legislation in the House of Representatives designed to prevent us from getting back some of our tax dollars as education funds. His first attempt was an amendment that was alternately approved in March, 2010 and then "scrubbed" from the final version of the Supplemental Appropriations Bill. He tried again and succeeded with an amendment. Section 11, added to HR 1586. Part 11 (A) of the Doggett amendment specifically limited distribution of any funds sent to Texas according to Title I, which favors bigger school districts at the expense of smaller school districts. Part 11 (B) required assurances that State education funding percentages would stay the same or increase in Fiscal Years 2011, 2012, and 2013. All of the other 49 States were only required to make assurances for one year. Our State Constitution does not allow the Governor to mandate how the Legislature will appropriate funds and our Legislature only meets for 120 days, every other year. In 2009, the Regular Session of the 81st Legislature ended on June 1st. Even if the Governor had called a special session of the 81st Legislature to vote on the assurances, Texas’ Constitution prohibits one legislature from binding future legislatures. The 81st Legislature was limited to making budget decisions through the 2010-2011 budget years. The current 82nd Legislature will not pass a budget for 2012-2013 until the end of this biennium’s 120 day Regular Session - at the end of May. Before the final passage of HR 1586 in September, 2010, the 22 Texas Republicans in the House of Representatives wrote a letter to then-Speaker Nancy Pelosi, outlining the fact that the assurances written into HR 1586 would violate the Texas Constitution. The response of Doggett and his fellow Democrats was and is that the Governor should give the reassurances anyway, since the only penalty would be political. It's obvious from the plain language of the amendment and from statements by Doggett and his supporters that the target of Section 11 is Governor Perry and the purpose is political revenge and control. Although supported by the rest of Texas’ Congressional Democrats both in March and August of 2010 (when there was real political hay to be made before the Primary and General elections), Doggett has been the most vocal in his defense of the restrictions that prevented $830 Million from returning to Texas to save teachers' jobs. Unfortunately, the rest of us will pay for Doggett's petty attempt to punish the Governor, since there's even less money in the State coffers than there was last summer. It appears that Texas school districts will have no choice but to cut their budgets and institute the Doggett Layoff. This is just pure horsexxxp. The only thing that Perry has to do is sign a piece of paper that says Texas will keep the same level of funding for education. At least Doggett has the best interest of Texas school children at heart. The teapot party has a slash and burn policy. They are forcing the layoffs of thousands of teachers. If I remember my economics right that means those salaries won't be available to be spent in their districts which in turn support the private sector and the hits just keep on happening. Oh wait I forgot billionaires are bankrolling the teaparty and after the slaughter is over these billionaires get to pick up bargin basement land. The State Constitution says the Governor can't sign. We don't know what the final education budget will be. You have a typical progression: all or nothing, depriving the children, hateful "teapot," then billionaires. What's sure is that Doggett made sure that less money is available and treats Texas worse than every other State. The politicians want your kids to grow up stupid and illiterate. That way they will be easy to control and just hand their $ over to them when they are grown. This is the seeds of a communist take over.